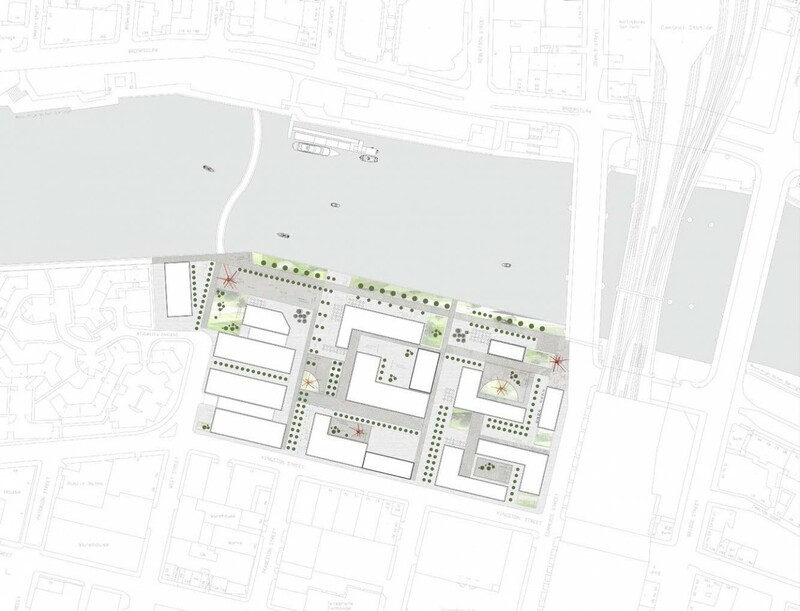 Stallan Brand have prepared an outline development statement for a mixed use transformation of Tradeston comprising a mixture of offices, homes, a hotel, serviced apartments, retail and leisure. 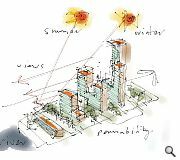 The ‘vertical’ vision outlines the potential for a new public square and gateway building to improve perceptions of the city for those arriving by train. Outlining their illustrative plans the architects observed: “Buildings along this edge have the potential to run North to South parallel with the railway lines to address the approach from trains and traffic from and to Central Station. 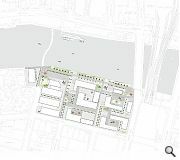 Stallan Brand are seeking planning in principle for the transformation on behalf of Drum Property Group for broad consent for its end use and floor space pending development of detailed design proposals. 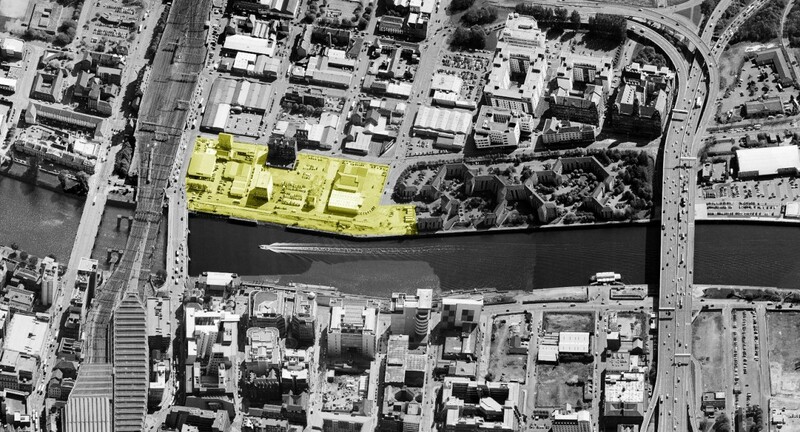 There was a previous scheme for this site which created urban blocks and public realm to the river, which was more in scale with Glasgow. 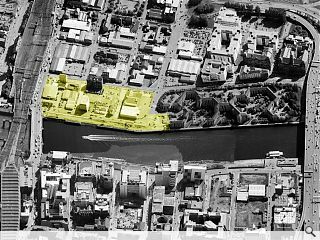 Obviously with this proposal, lessons from Glasgow Harbour have not been learnt? A welcome move for this stretch of waterfront neglected for too long. 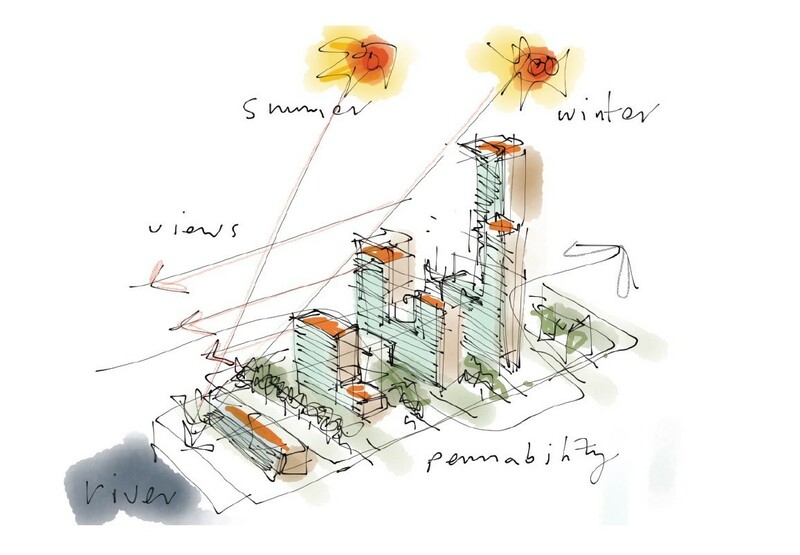 A decent dense proposal with good height would be excellent, if it proposes retaining the two listed buildings on site. Pity we are stuck with that awful zig zag footbridge, but some decent towers here could distract from it greatly. Could act as a great catalyst for Tradeston which has the potential to be one of the most exciting districts in central Glasgow, full of beautiful listed buildings, which should of course be retained and restored, but with plenty of potential for new build when the 1980s/90s warehousing is torn down. This area is badly in need of regeneration, with extreme potential, I just hope they properly integrate the area, maybe some shops a bar/restaurant and set the theme for the rest of the area, while restoring the beautiful old buildings there, which hopefully, none will conveniently go on fire anytime soon. Potentially saw tradeston as the perfect area to create a new area of Glasgow City Centre as an area with lots of pubs and clubs and hotels creating a buzzing nightlife within the area alone.